Correlation is a statistical measure of the relationship between any two assets (currency pairs, commodities, stocks, etc.). The correlation between any two currency pairs in a Forex market can be either positive or negative. If two currency pairs share a positive (direct) correlation between them, then the direction of price movement will be the same at any given point of time. Likewise, if two currency pairs share a negative (inverse) correlation between them, then the direction of price movement will be mutually opposite at any given time. A trader should also remember that in most cases, no correlation exists between two currency pairs. A trader will be able to take two trades at the same time by monitoring the price movement of one currency pair, which shares a correlation with another. So far, we had spoken about trading currencies in non-option markets. A binary market is a bit different considering the fact that time plays a rather important part than the quantum of price movement in a particular direction. Let’s study how far correlation between two currency pairs can be used successfully in binary trading. Two currency pairs with a positive correlation may move in the same direction. However, the quantum of movement may not be the same. For example, the EUR/USD and GBP/USD pairs share a positive correlation. This means that when the EUR/USD pair is trending upwards, the GBP/USD pair will also be in an uptrend. However, for every pip movement seen in the EUR/USD pair, there may not be a pip movement in the GBP/USD pair. If the GBP/USD pair moves by one pip for every pip movement seen in the EUR/USD pair then both currency pairs are said to have a perfectly positive correlation coefficient of +1. In percentage terms, it is expressed as 100%. Similarly, the EUR/USD pair shares a negative (inverse) correlation with the USD/CHF pair. This means that if the EUR/USD pair is an uptrend, then the USD/CHF pair would be in a downtrend. However, for every pip movement seen in the EUR/USD pair, there may not be a pip movement in the USD/CHF pair. If the USD/CHF pair moves down by one pip for every upward pip movement seen in the EUR/USD pair, then both currency pairs are said to have a perfectly negative correlation coefficient of -1. In percentage terms, it is expressed as -100%. Fortunately, a binary trader need not go through the difficulties of calculating the correlation between various currency pairs, commodities and precious metals. Most of the finance related websites offer them for free. In this regard, there are two reputed sources of information that a trader can use to his advantage: Oanda and Mataf. Oanda enables a trader to study correlation between major currency pairs, exotics, metals, indices, commodities and even US/UK Treasuries. The checkboxes provided next to the asset categories enable a trader to narrow down the selection. Once the list is narrowed, a reference currency (or any other asset), indicated by a green underline, can be selected by double-clicking the mouse. Now, the correlation between the reference currency and the assets belonging to the selected category are displayed for a period ranging from an hour to a year. A trader can choose a standard table format or other forms of visual presentations (bubble, heatmap) to study the correlation, as shown in the images below. A detailed popup message indicating the level of correlation is shown when the mouse pointer is moved over the bubble or heatmap. The greater the bubble size, the higher is the correlation. Dark red and blue colors indicate the strongest positive and negative correlation, respectively, between currency pairs (or any other assets). Grey color indicates lack of correlation. 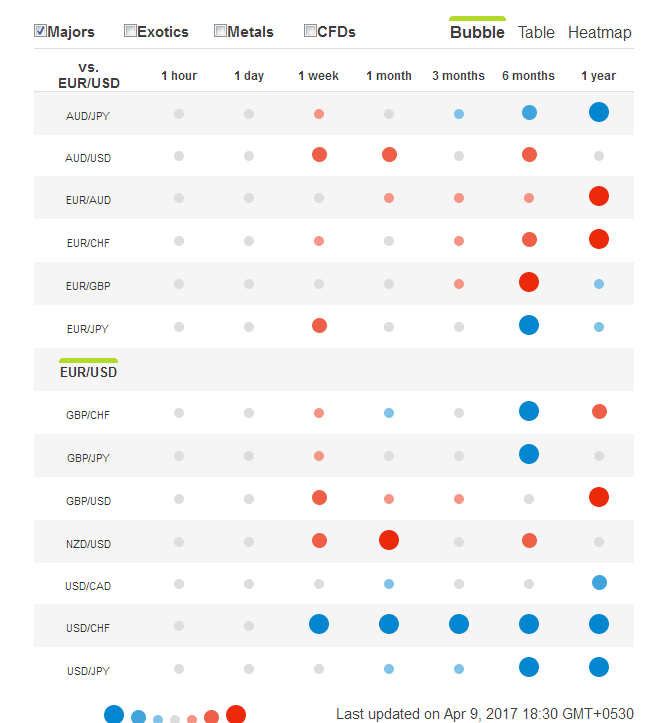 We chose to find the EUR/USD pair’s correlation with its major rivals through Oanda.com and received the details (table, bubble, and heatmap) as shown below. The financial website Matef.net visually displays correlation as a graph instead of a bubble or heatmap. It is needless to say that the table format is readily available as well. 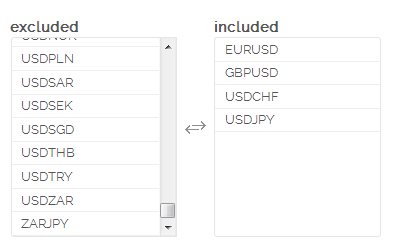 Two tabular columns (named ‘excluded’ and ‘included’) are provided for the selection of currency pairs. Notably, only the most common currency pairs are offered for study. Once the currency pairs are selected, as shown below, the page displays the correlation coefficient in the form of a table along with a graph. The correlation data is provided for a period of 5 minutes, one hour, four hour, and one day. The graph enables a trader to identify the periods of increasing and decreasing correlation even with a given timeframe. It would be useful for a binary trader to time the entry. The first thing a trader can notice is that the correlation between two currency pairs is not the same across all the timeframes. 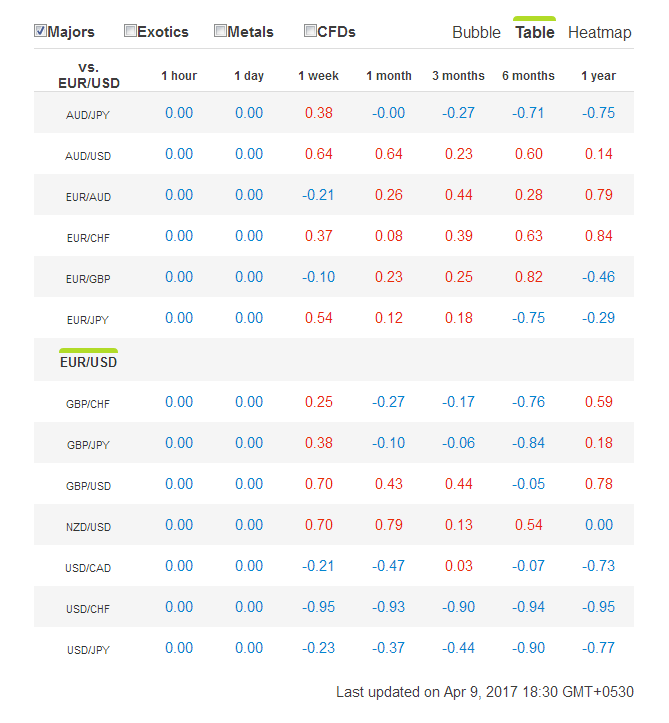 For example, the Oanda’s correlation map shows high positive correlation between the EUR/USD pair and NZD/USD pair in a 1-month timeframe. However, in a 3-month timeframe, the correlation remains neutral (no correlation). 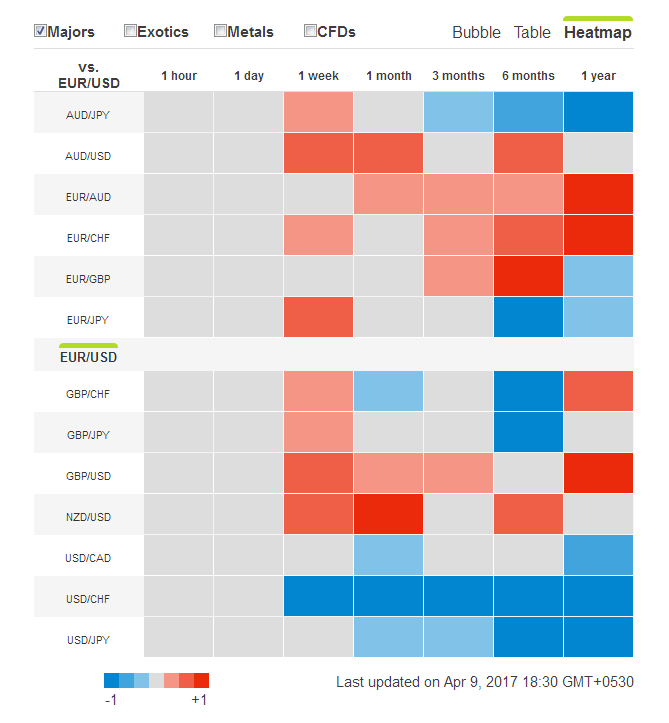 As it can be seen in Oanda’s table, in a weekly timeframe, the EUR/USD pair shares a positive correlation with the GBP/USD pair, and a negative correlation with the USD/CHF and USD/JPY pairs. However, the EUR/USD shares a higher negative correlation of 95% with the USD/CHF pair, compared with only 23% negative correlation with the USD/JPY pair. This means that while betting on an uptrend in the EUR/USD pair, a binary trader should choose to bet on a downtrend in the USD/CHF pair, rather on the USD/JPY pair. This would increase the probability of success in the trade as long as the contract expiry period is one hour. It should be remembered that correlation percentage between any two pairs is not a constant. So, a binary trader should regularly keep himself updated on the changes in the correlation ratio. After collecting correlation details between different currency pairs, commodities, and metals, a binary trader can open trades as described further. A binary trader should first look for two currency pairs with low positive correlation in a timeframe less than or equal to one hour. Once the currency pairs are selected, a trade should be opened in the simplest of option contracts, i.e. a call or put option (or their equivalent). Even though both currency pairs may move in the same direction, the extent of movement will not be the same since the currency pairs have a low positive correlation. Thus, trading a one-touch option or ladder option may prove futile. Furthermore, the trader should make sure that the expiry period of the option matches the timeframe used to study the correlation. Once an uptrend is confirmed, a trader should purchase a call option in both the currency pairs. This means that a trader who has identified a low positive correlation between two currency pairs in a 1-hour timeframe should choose to trade contracts which expire in an hour and not later. If the trader spots a downtrend, then a put option should be bought in both the currency pairs as described above. Again, the expiry period of the option should match the correlation timeframe. To begin with, a binary trader should choose two currency pairs with high positive correlation in a timeframe of not less than a day. Once that is done, the trader should select a contract which offers a greater return on investment. A one-touch call (or put) option or even a ladder option can be selected. Furthermore, it is better to select and trade currency pairs with high positive correlation during major economic news announcements. Since both currency pairs would more or less rise or fall to the same extent, it is enough to spot the trend of a single currency pair and enter into two trades with confidence. Since major economic events drive a currency pair in a particular direction for several days, a trader can choose a contract with an expiry period ranging from one day to even up to a week. However, the trader should make sure that the expiry period of the option matches the correlation timeframe. In this case, two currency pairs which have a low negative correlation in a timeframe of one hour should be selected. Once an uptrend is identified in a currency pair, a call option should be bought. Simultaneously, a put option should be bought in the currency pair which shares a low negative correlation with the currency pair in reference. It is better to stick with simple contracts (call and put option combo) having short-term expiry periods that match the correlation timeframe. It is similar to trading currency pairs with a high positive correlation. Initially, two currency pairs with a high negative correlation in a timeframe not less than a day should be selected. This is followed by the selection of an option contract which offers high returns. The contract should be preferably traded during major economic news releases. Once an uptrend is confirmed in a currency pair, a one-touch option or a ladder option (depending on the impact level of the news) can be bought. Simultaneously, a similar contract with target levels in the opposite direction can be bought in the currency pair which has a high negative correlation with the currency pair in reference. The trader should also make sure that the chosen expiry period matches the correlation timeframe. A binary trader can also select a one-touch option contract for a currency pair and a no-touch option contract for the other correlated currency pair, as long as the target levels are in the same direction. Since the actual movement of currency pairs would be in a mutually opposite direction, both trades would expire in the money. Care should be taken to select an expiry period that matches with the correlation timeframe. Once a binary trader learns to set up trades based on the basic techniques explained above, complex trades can be constructed to generate returns from multiple trades by simply concentrating on the price movement of a single currency pair. Choosing a broker with multiple currency pairs available is recommended if you want to benefit from correlation trading.